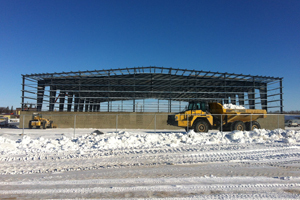 "I am happy to be able to partner with the province on this new arena project. Peguis First Nation will see many benefits from this important new facility including community building, increased wellness for all ages, and safe and healthy activities for our youth. The community is grateful to see this much‑needed facility become a reality," said Peguis Chief Glenn Hudson. The community was devastated when the previous arena was destroyed by fire in 2007 as it was well utilized by both young & old alike. Hockey rinks had to be rented in other communities with many hours of travel involved. The province is providing funding of $5.6 million and an application has been submitted to the federal government for another $5.6 million. The Surrender Claim Trust will cover $10.6 million in construction costs. "A recreational complex is often the source of community pride and a gathering place for all ages" said Infrastructure and Transportation Minister Steve Ashton. "Our government is pleased to be able to help ensure this important facility gets back up and running to provide a whole host of fun, healthy activities"
"The new arena will meet current recreational challenges left following a devastating fire that destroyed the old arena in 2007" said Ashton. The target date is for Winter 2013. On Oct. 1, at 10:00 a.m. Peguis First Nation Arena Committee and NDL Construction Ltd. signed a contract for a new arena complex to be built in Peguis with a total project cost of approximately $16 million. 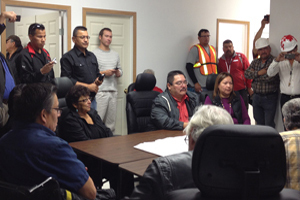 Peguis First Nation witnessed the signing of the contract between The Peguis Arena Committee and NDL Construction on Monday October 01,2012. The event took place at the Peguis Flood Centre. 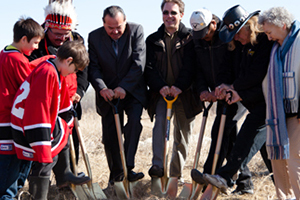 The long awaited event paved the way for construction to begin of the Peguis Community MultiPlex and Recreation Facility. Peguis First Nation annually spends approximately $2 million in hydro subsidies and payments for social and subsidized housing. 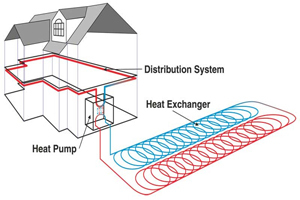 Geothermal heat pump systems are energy efficient and environmentally friendly. They use the earth's renewable energy to heat or cool your home. As many of you are aware there have been new housing going on in the community. Nine (9) to be exact, 3 of which are being stick built on site and 6 of which were in panel format ordered from Pacific Homes in British Columbia and constructed on the old Arena site. The purpose of the homes is to replace homes damaged through numerous flooding disasters over the past years. Progress started this past August and carried on to date. The estimated time of completion is not known at this time due to hydro not being connected yet. However, all 9 homes are on foundations ready for servicing. 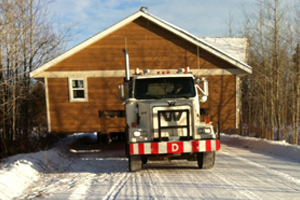 The moving of the homes was handled by Reimer Home Building Movers based out of Arborg. All moves were done two homes at a time. The first move was on November 30, 2012, then two more each week after that. The next Phase of the Flood Replacement Homes will include six (6) homes of the same style and layout built on the old Arena site. CP Construction is now waiting on approval from AANDC to provide funding to begin construction. All of the labor is done with local employees and the majority of the materials ordered threw Peguis Home Hardware. Chief Peguis Construction erected two ring dikes in Peguis First Nation in 2012 to help with long term flood midigation. We plan on erecting more ring dikes in the near future within Peguis First Nation based on recommendations. Mold Abatement is the process of removing and cleaning mold from a mold infected unit. Once Pinchin Environmental confirms mold in a unit, Chief Peguis Construction steps in to do the Mold Abatement. Peguis has trained 22 local band members through Pinchin Environmental. There are currently 48 units that received the Mold Abatement in Peguis First Nation. 20 of the trainees were involved in the Abatement of these 48 units. Chief Peguis Construction plans on training 20 more band members in the near future and completing 186 more Mold Abatement to units in the community.